The Capital One Bowl game (named after its title sponsor Capital One) is an annual college football bowl game in the post-season and traditionally takes place on New Year's Day (right before the Rose Bowl) in Orlando, Florida. The game is the 3rd oldest non-BCS bowl game behind the Cotton Bowl and the Sun Bowl. Since its inception in 1947 the Bowl was known under different names: The Tangerine Bowl, the Florida Citrus Bowl, and the Capital One Florida Citrus Bowl. It is also situated right below the top tier Bowl Championship Series (BCS) bowls, which gives it 1st choice (after the BCS) from the SEC (Southeastern Conference) and the Big Ten. For the 2010 bowl game the following teams will be matched-up: The Penn State Nittany Lions, representing Pennsylvania State University from University Park, PA in the Big Ten Conference vs. the LSU Tigers, representing Louisiana State University (LSU), Baton Rouge, LA in the SEC (Southeastern Conference) Western Division. The title sponsor (2001 - present) is Capital One Financial Corp. (NYSE: COF), a Fortune 500, U.S. based bank holding company in Tysons Corner, VA, that we all know for financial services and products from credit cards, home loans, auto loans, and banking, to savings products. 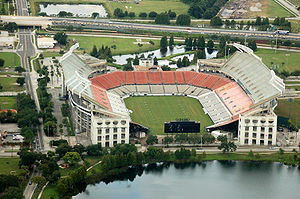 The Florida Citrus Bowl Stadium (formerly Orlando Stadium, Tangerine Bowl and the Citrus Bowl) was opened in 1936 with a capacity of 10,000. Over time the stadium was expanded several times and can now seat over 70,000 spectators for different sports. That made it a so-called multi-purpose stadium. Its main purpose, however, is football with other main events being the Champs Sports Bowl, as well as (non-football sport) Monster Jam. Buy your Capital One Bowl Tickets now before it is too late and be one of the tens of thousands enthusiastic fans in this great stadium.